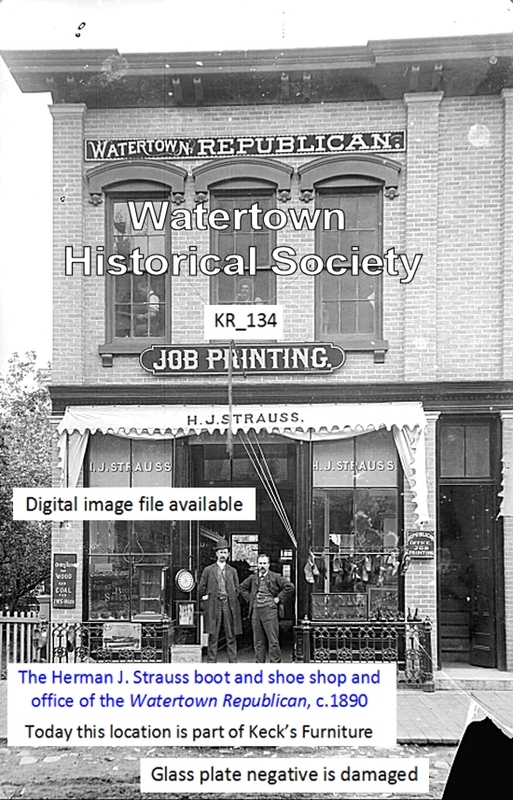 In 1853, only 17 years after Watertown was settled by Timothy Johnson, the first issue of The German Press, the Anzeiger, carried a card advertisement announcing the opening of the shop of John Keck, cabinet maker, at 314 Main Street. 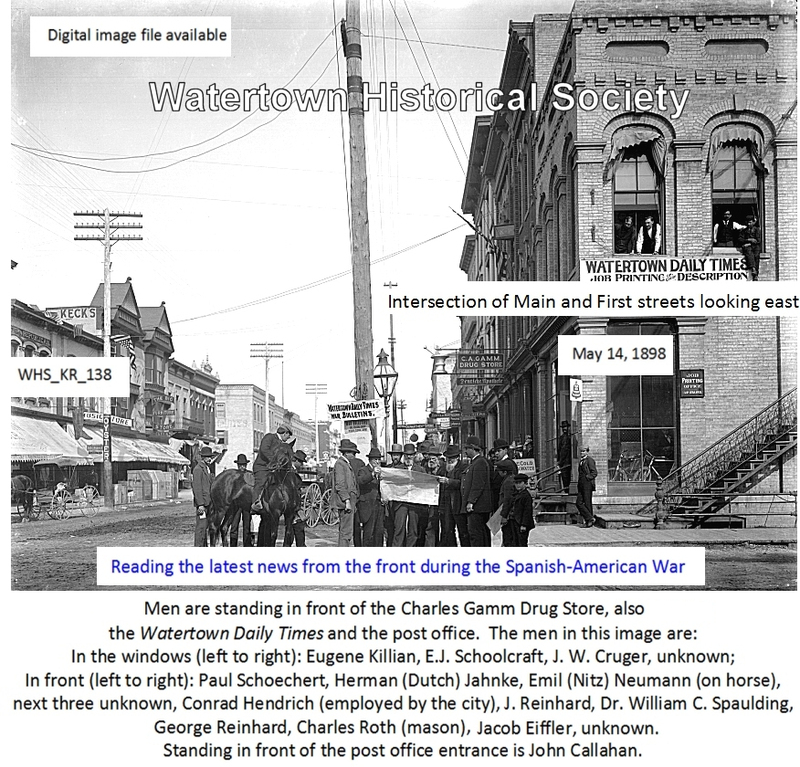 At the time, Watertown was a bustling frontier town with a population of 4,000. 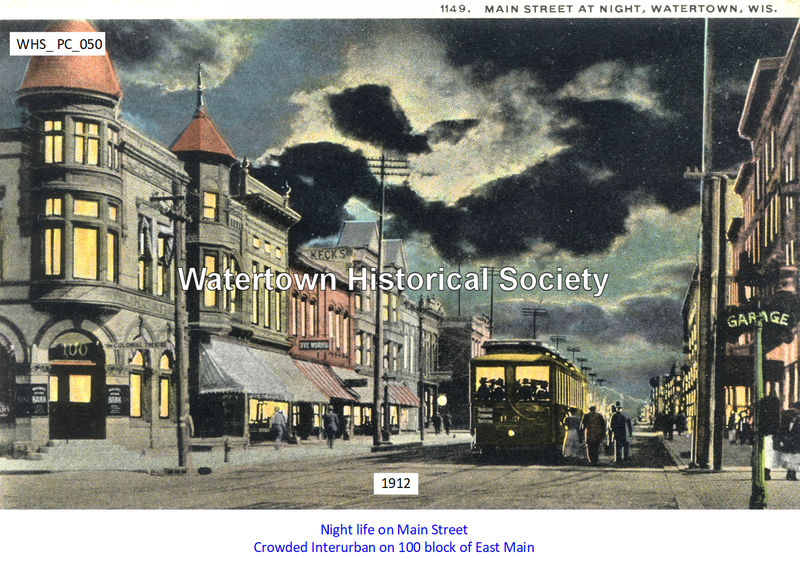 The downtown and surrounding neighborhoods were home to 28 dry goods stores, 24 groceries, 5 meat markets, 9 hardware stores, 6 clothing stores, and 6 boot and shoe shops. The rapids of the Rock River powered saw mills, flour mills, carriage shops, blacksmith shops, and lumber and brick yards. 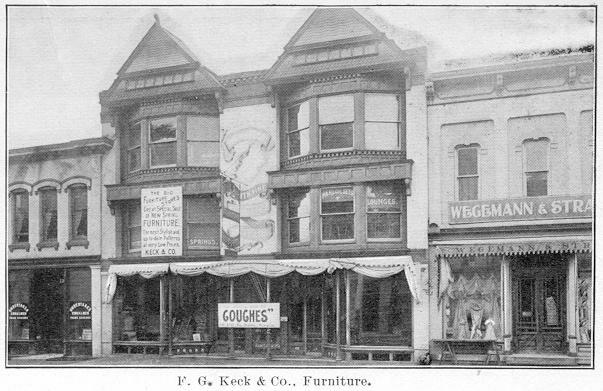 From its humble beginning, Keck Furniture relocated twice before moving to its current location on Main Street in 1897. The store still occupies this character-rich location, complete with tin ceilings and floor joists of tamarack logs, cut during the earliest days of settlement in Wisconsin. In 1924, F. G. Keck's "Big Furniture Store" underwent extensive exterior and interior remodeling, executed by George, Fred and William Keck, grandsons of the founder, and one of America's leading architect teams of the mid-20th century. 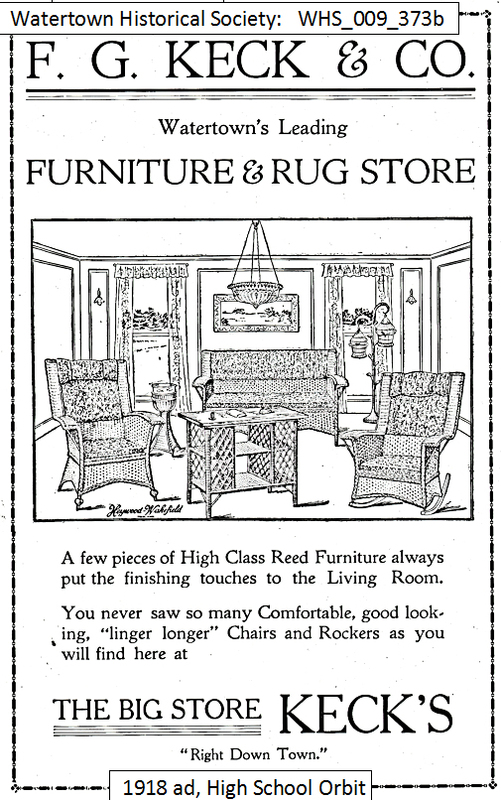 During the dark days of the Great Depression, the personal service of Keck Furniture provided through its early years paid dividends, as the business persevered, and area residents continued to patronize the store. From 1938 until his passing in the mid-1950s, Keck Furniture was operated by John Keck, grandson of the founder. During this period, a young Ken Beyer was employed as a delivery and salesperson. After John's passing, the Keck family struggled to find a suitable candidate to pilot the furniture store. They chose Ken Beyer, who had left Keck's a few years earlier to work at another area furniture store. Under Ken's leadership, Keck Furniture experienced a period of growth, culminating in an expansion in 1989, which tripled the store's size. Upon his retirement in the late 1990s, Ken Beyer relinquished the store's operation to his son, Tom, and daughter, Lyn Quinn. Under their leadership, Keck Furniture continues its tradition of service and value that started in 1853. 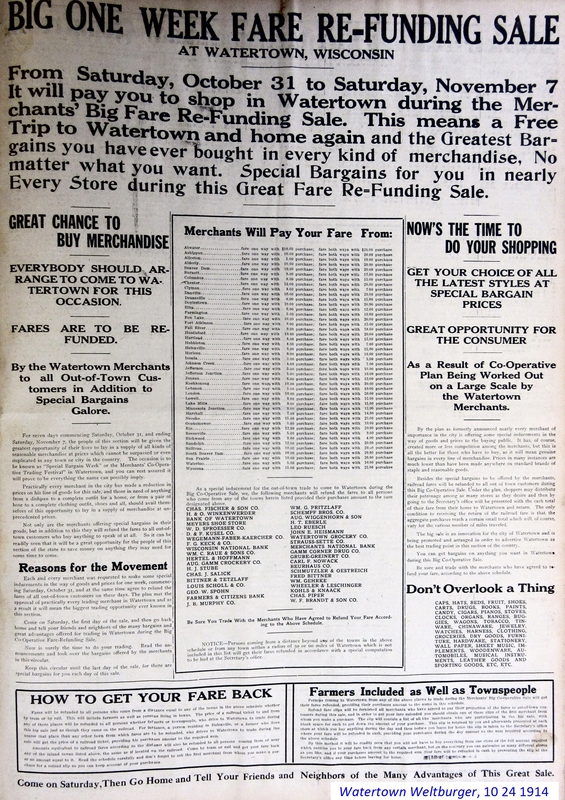 Keck’s was one of the furniture store businesses founded by a prominent German family. 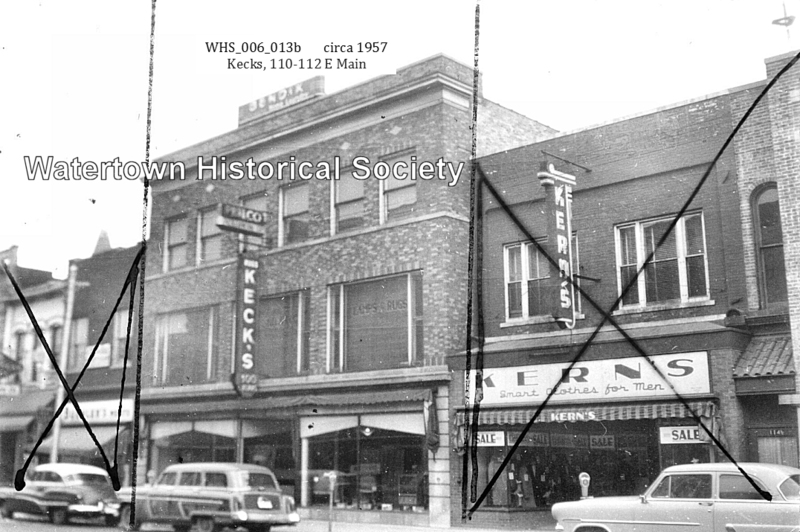 The Keck Furniture Store was started by German immigrant John Keck in the 1850s, and continued by Keck children and grandchildren until the recent past. The second furniture store was Schmutzler’s, started with pioneer carpenter and builder Christian Schmutzler's son Edward entering the firm of Charles and Frank Nowack in 1874. Keck Furniture was founded in 1853 by John Keck, who later left the business to his son, Fred George, who in turn entrusted the business to another John Keck. This John died at a relatively your age, and though he had three brothers, none were interested in the furniture business. A series of managers were hired, none lasting long. Ken Beyer worked in the store since 1948. Having worked in the store for so many years, he was fully prepared for management, which he assumed from 1963 until 1998. At that time, his son, Tom, and daughter, Lyn, took over the business. Keck Furniture is the oldest continuously running furniture in the state and the fourth oldest in the nation. 1859 Keck & Lehmann’s Cabinet Ware Rooms . . . The Keck Furniture Co. dates back to 1853, the year John Keck, the grandfather of Pete Keck of the Keck Advertising Agency in Oconomowoc and other members of the family, started in the furniture business here. During the recent remodeling of the former Buerger's Meat Market, later Block and Andres and then Block's Market at 112 South Second Street the workers came across a brick on which was carved "F. Keck." The building will soon be occupied by Grempel's Shoe Store, the remodeling project having prepared it for the new occupancy. Because of the cumbersome transportation facilities during the middle of the last century, with Milwaukee being a five to seven day round trip by way of Oconomowoc and Waukesha, it is considered a pretty safe guess that the brick in question, along with thousands of others, was made in the old Quentmeyer and Boomer brickyard at the south end of Utah Street in Watertown. About that time, the brick in question became part of the street end of a common wall between the buildings still in existence at 110 and 112 South Second Street. In 1863, after having been in several different downtown locations, John Keck decided to move his expanding furniture business into the building at 110 South Second Street. Fred G. Keck, father of Pete Keck, was born in 1869, the youngest of five children of John and Rosina Keck. His youth was spent in the vicinity of the building as the family home was at 300 South Second Street, a block and a half south of the store. 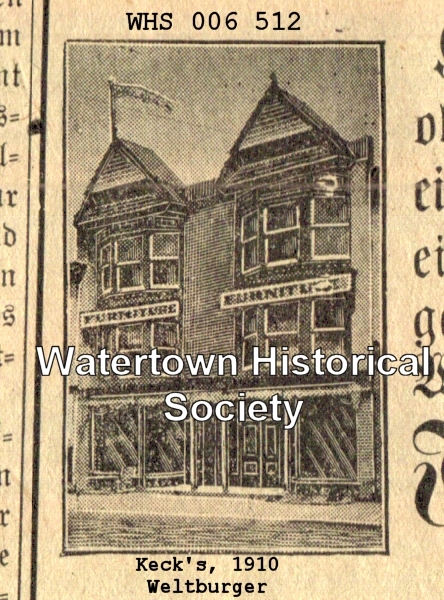 Death has claimed one of Watertown's oldest and most esteemed citizens, in the person of John Keck, who departed this life at his home in the First Ward on April 18th, 1891, his final illness being pneumonia. He had been seek but a few days, hence his death was unexpected by his friends. Deceased was a native of Germany, being born there on December 19, 1818; consequently he was in his 73d year at the time of his death. He came to America and located in New York City in April, 1850, remaining there until June, 1851, when he removed to this city. He worked here as a cabinetmaker until 1858, when he engaged in the furniture business for himself, which he conducted very successfully up to the time of his death. He was a member of Washington Lodge, No. 77, L.O.O.F., and was one of its organizers some 35 years ago. He also helped to organize the Concordia Society in 1862. Mr. Keck was possessed of an honest and frank disposition and all who knew him honored and esteemed him for his integrity and honest manner of dealing with his fellow man. Our citizens mourn his death as that of a good and noble man. His funeral was held from his late home, under the auspices of Washington .Lodge. L.O.O.F., Rev. Mr. Sterz of the German Evangelical Protestant Church conducting the religious services. His remains were followed to their final resting place in Oak Hill cemetery by a very large number of sorrowing friends. 01 12 KEN BEYER PRES. & GEN. MGR. Kenneth F. Beyer, age 88, of Watertown, passed away on Feb. 4, 2016. Funeral services will be held on Monday at noon at Trinity Lutheran Church in Watertown with the Rev. Brett Brauer officiating. Burial, with military graveside rites performed by the Watertown American Legion Post No. 189, will take place at Lutheran Cemetery in Watertown. Kenneth Francis Beyer was born on Nov. 9, 1927, in Lake Mills, the son of Carl F. and Lydia (nee Albrecht) Beyer. He was a 1945 graduate of Watertown High School and he attended one year at the University of Wisconsin-Madison. Ken served in the United States Navy during World War II and was company commander of the Army National Guard units in Jefferson and later in Watertown. On Sept. 8, 1951, he married Elaine Hensler at St. Mark's Lutheran Church in Watertown. 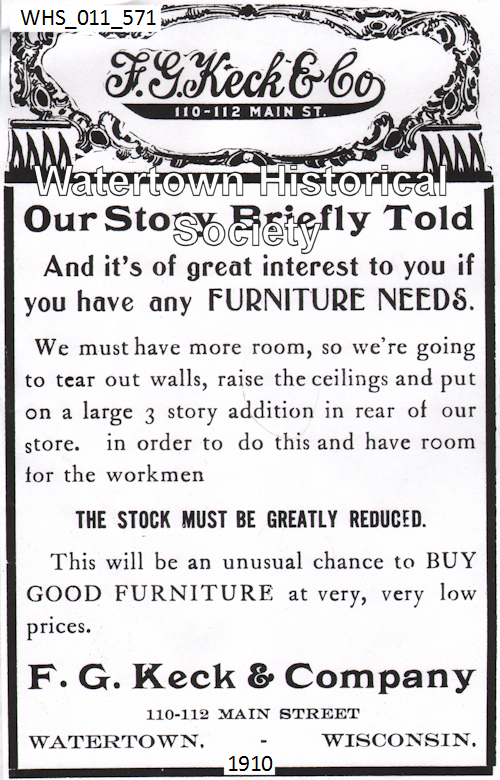 Ken owned and operated Keck Furniture in Watertown. He was a member of Trinity Lutheran Church and the Watertown American Legion Post No. 189. Ken was a former member and past president of the Watertown Rotary Club where he received the Paul Harris Fellow Recognition. He was also a member of the Watertown Central Business Association and the Watertown Area Chamber of Commerce.